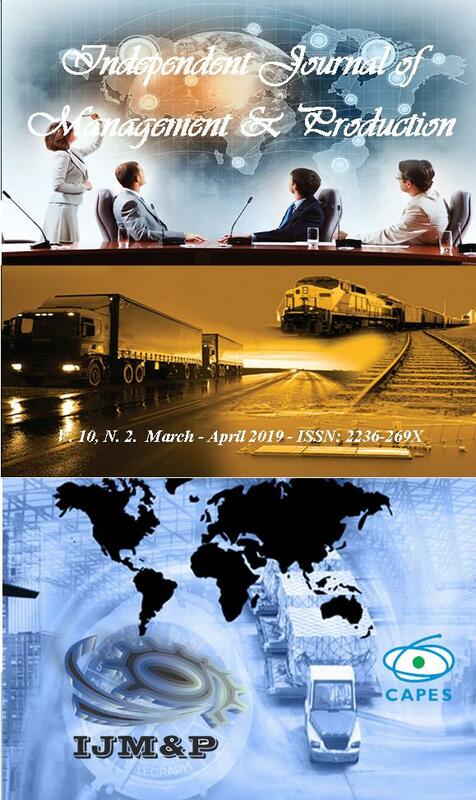 The IJM&P is a journal for unpublished works related to Administration and Engineering of Production and Mechanics and Economics and Agricultural and Natural Resource as well as works that present results of studies and researches about the activities of Science and Technology Information. The Journal is published on a bimonthly basis in "February, April, June, August, October and December". All items sent to the newspaper, go through the peer review, being all members of the international scientific community. For further detailed information, please see about and policies Click here. The material submitted to this journal should be unpublished and, therefore it must not have been published or submitted to meetings or to other periodic. The article should effectively represent contribution within the area and discuss about a relevant topic. The theoretical basis should be up-to-date and should represent the state-of-the-art of the knowledge in the area. The scientific method should be explicited and the analyses and conclusions should be clear and lined up to the considered objective. Works that involve pure bibliography revision should deal with a current thematic and the approach should be deepened and analytical. The IJM&P publishes works in English. Independent Journal of Management & Production is a Brazilian electronic journal, which addresses the scientific community: teachers, researchers, students and professionals working in the field of production engineering and related (Administration, Accounting and Economics). The following is the pie chart with distribution of users by Degree Journal, this distribution is represented in percentages. Messrs. About authors on the link, submissions, Author guidelines, we provide templates for article submission: the first template is the unidentified one called "Manuscript Template", in which the rules of formatting and citation are included, the second template called "Manuscript Template author identification", it would be for photo ID, and a biographical resumé, the third template entitled "Authorship responsibility and Copyright Transfer" is the copyright and responsibility of the authors, this template must be dated and signed by all authors, the second and third template must be sent in a supplementary file option Click here. The journal also allows the publication of Master's Degree Dissertations and Doctoral and Postdoctoral Thesis to stimulate the dissemination and interchange of tacit and explicit knowledge in any language. Guidelines of ethics incorporated into the journal activities contributing to the improvement of the quality and clarity of the submitted manuscripts, these guidelines are being made available in October 2014. Click here to download. In the table below is informed of the situation Partial articles to be published in each of the volumes / numbers. The update occurs in this table each approved article, edited and finalized. The maximum number of articles per issue is 15. The Independent Journal of Management & Production (IJM&P), with e-ISSN: 2236-269X WebQualis are rated in the table below are the classifications of IJM&P areas of knowledge related to the editorial line of the Journal. From July 2013, we received information on the impact factors for the year 2012 of some indexing organs, which are presented below.